The Trust is currently investigating a site at the Flagstaff House complex of buildings, within the old garrison at Colchester, and just up the road from our building – Roman Circus House – and the Roman circus centre. The site is so important and interesting that Trust director Philip has made several site visits this week and taken several of his own photo.s! 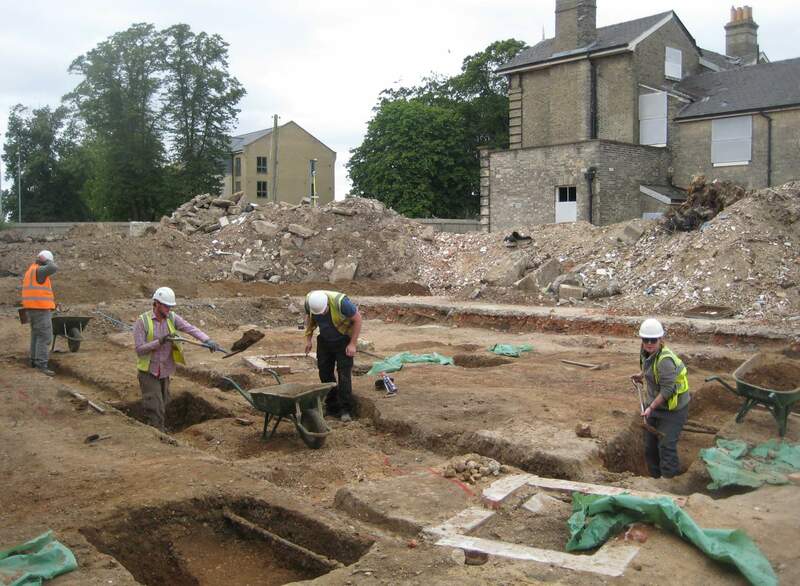 Last week, the excavation team uncovered part of the remains of the Roman circus on the site. We have been able to plan the circus, and the remains here are exactly where we expected them to be. However, the site has been heavily disturbed: we have already uncovered eleven service trenches and seven man-holes, and we are now removing these so that we can investigate the surviving remains of the circus here. We can already see the remains of the circus emerging in the gaps between the modern trenches. These consist of robber trenches which represent the wide foundations of the outer wall of the circus cavea (seating-stand), which were robbed for building materials, possibly in the late medieval period. We have not yet uncovered the narrower inner foundation of the cavea here. We have uncovered one solid chunk of stone foundation, and this was part of a buttress: this conforms to a pattern which we have observed during previous investigations of the site of the circus, where the main foundation has been robbed out but the buttress foundations have been missed and survive, probably because they project out from the line of the main foundation. Today, at the Flagstaff House site, Philip took the latest photo. of Colchester’s Roman circus, showing part of the robbed foundation of the outer wall of the cavea. This is the first time that this part of the circus has been exposed. The images show two of Philip’s photo.s of the current Flagstaff House site: yesterday (29th July), with members of the excavation team hard at work, and the latest photo. 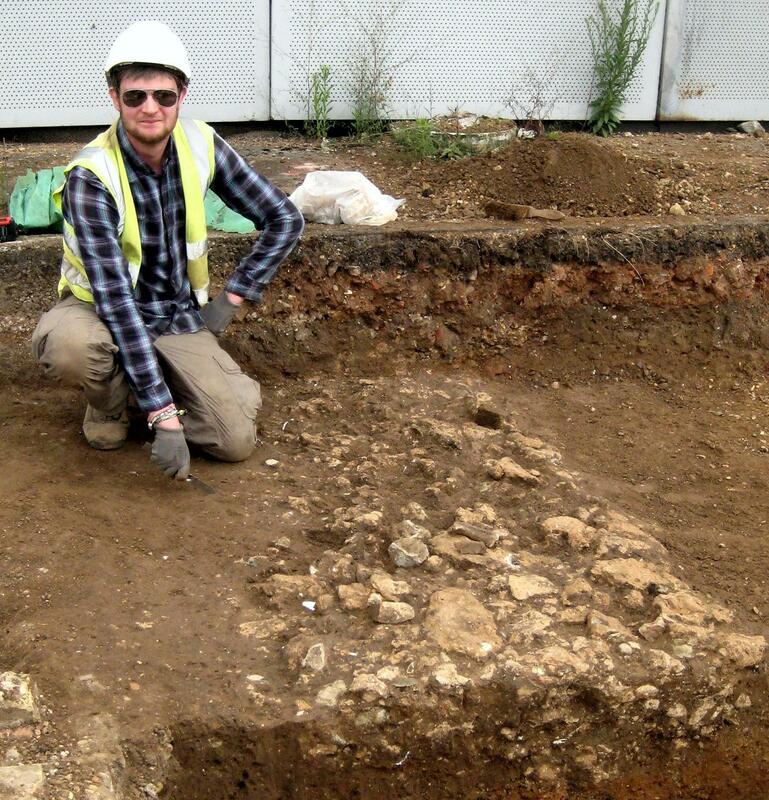 of the remains of the circus, on site today (30th July), with Trust excavator Robin. You can compare it with the third image, which shows the first photo. of the remains of the circus under investigation, in 2002 (JF605 and JF606, Trench J6, in Area J1 just along the road from Flagstaff House – the lighter band of soil represents a robber-trench which defines part of the foundation of the circus). * From CAT Report 138: in February-March 2000, on a site on the Abbey Field, the first evidence of the circus was recorded. The evidence consisted of structural features F208, F209 and F210, which were noted in narrow trenches dug by the contractor for floodlight cables to the north-east of the excavation. 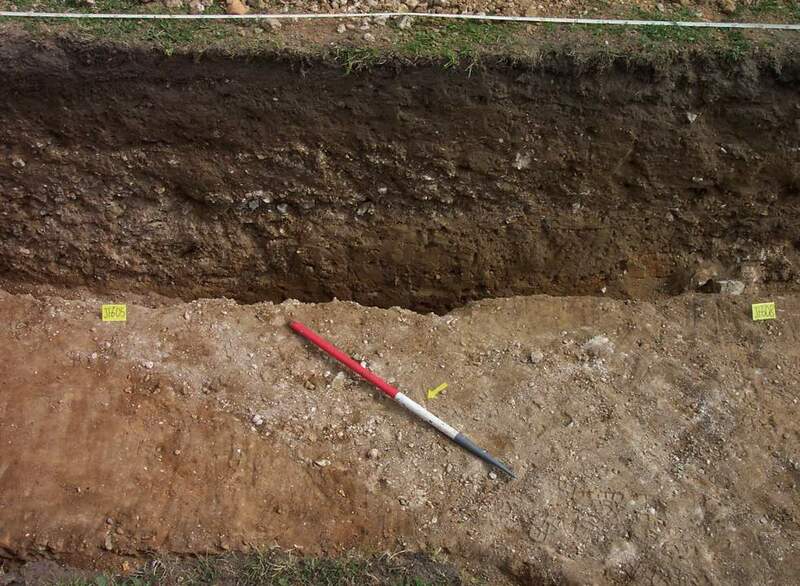 ‘… An east-west trench, approximately 80cm wide, was filled with compacted mortar and appeared to bottom out at an overall depth of 60cm. Approximately 1.4m to the south of F208, a group of large mortared stones was partly exposed (F209). The feature continued beyond both sides of the contractor’s trench and appeared to be on a similar east-west orientation to F208, although this is uncertain due to the restricted dimensions of the trench. At a spot approximately 35m to the east of F208, the cable trench revealed a second mortar-filled east-west trench (F210), approximately 80cm in width. F208 and F210 appear to be robber trenches, resulting either from the removal of two foundations on the same alignment or pehaps a single long stretch of wall foundation. The mortared stone F209 is assumed to be an undisturbed foundation, although too little was exposed to permit satisfactory interpretation of this feature…’.